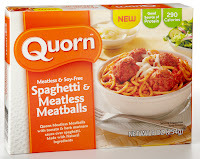 This week, another Quorn entree: this time Quorn Spaghetti and Meatless Meatballs. Now, I'm a big fan of Italian food. My grandmother was Italian, and so I've got garlic and tomatoes running through my veins. Needless to say, I've got some pretty high standards when it comes to spaghetti. With that in mind, let's take a look at what they've put up here. Once again, few minutes in the microwave, and we're ready to begin. Once the meal was out, I stirred the pasta and the sauce together and immediately noticed a huge problem (for me, anyway). The noodles were only about two or three inches long! Now, I don't know why I have such strong feelings about this, but it feels like they don't trust me to twirl my pasta around a fork, and have decided to cut it up for me, like I'm a child. In the picture on the box, you can't see any noodle-ends, making it look like the strands are all full-size (you know, for grown-ups), but in the box, little kid-size bits. Ugh. Whatever - moving on. So how does it all taste? Well, bland, to be honest. I tried adding some parmesan cheese (because it is awesome), and then when that didn't work, some straight-up salt. The salt helped a little, but it was still just a boring tomato sauce. More herbs! More garlic! More flavor please! Oh, and the meatless meatballs were okay - not great. Also bland. On the plus side, the noodles weren't mushy - nicely al dente. Hi Tracy! We love your blog! Very good reviews! I am an unabashed omnivore exploring the crazy world of meat alternatives. When first embarking on this adventure, I checked online for reviews of the different brands of fake meats but couldn't find out what I wanted to know. Is this tasty, or just tasty relative to other fake meats? How is the texture? How does it look? Would meat eaters enjoy it as well? So those are the questions I'm here to answer. I hope you enjoy my adventures and find them useful. Want to help support my outrageous fake meat grocery bill? Donations are a great help!